This is really clever. 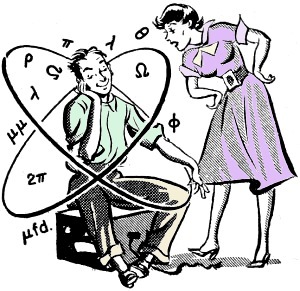 Appearing in a 1955 edition of Popular Electronics, "The Electronic Husband" is one wife's attempt to quantify her husband's interest in all things electronic by adapting forms of Ohm's Law to fit observed behavior. In the process of writing the parody, Mrs. Jeanne DeGood demonstrates a good basic knowledge of Mr. DeGood's second passion. I think after all the articles that Melanie has proof read for me that she probably knows a lot of these equations as well. When a man becomes interested in electronics, he becomes so tied down to his work that his wife can't pull him away from his workbench. Such wives could use the lessons learned in electronics to good advantage. 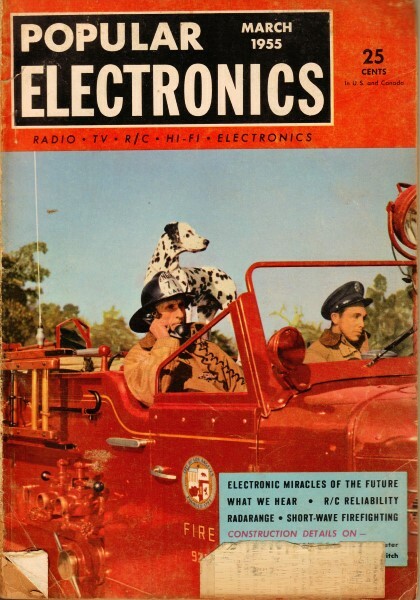 The simplest form of electric circuit is a man with work to be done, and resistance connected to his terminals (see Fig. 1). This circuit is broken or opened when a connection is removed at any point. The connection to be broken is usually at a point between the husband and his workbench, and the wife who desires her husband to work needs only to break this connection. This can be stated as follows: The work that I (me) want done is directly proportional to what E (he) wants to do, and inversely proportional to his R (resistance) to the work. 1 = go to the grocery for me? The simplest method of completing the equation at this point would be to remove the R (resistance). This may be done easily when the resistance happens to be a soldering gun, a tube tester, or a voltmeter. However, since the resistance in this case happens to be a workbench, removing the resistance might be a bit difficult for a 110-pound housewife. This can be stated: P (power) - the rate of doing work - is equal to E (amount of energy required for the job) multiplied by I (the amount of interest in the job). A quick glance shows us that P0 (power outside) may also be measured in muscles. Pi (power inside) must be measured in vitamins. W (work - getting it done) = P(patience) x T (time), for the husband has now finished the work he was doing and is now ready to go to the grocery willingly.